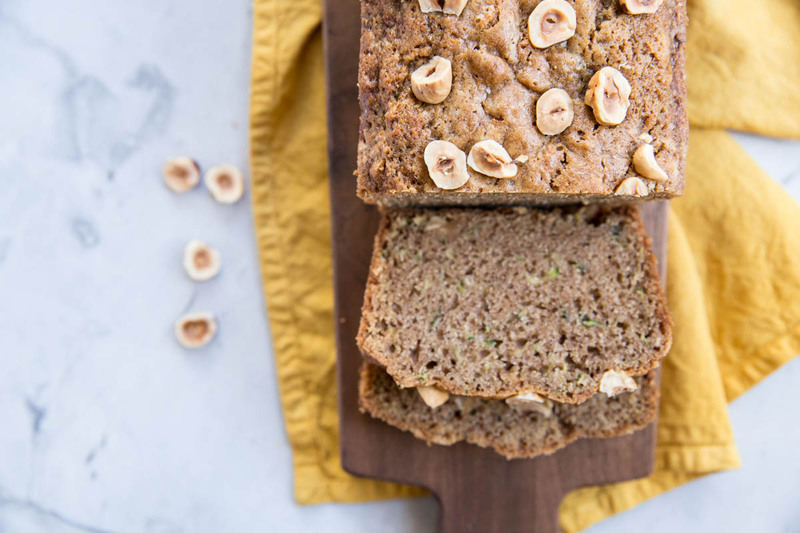 I’m reposting this recipe for Hazelnut Zucchini bread, why… because I make it every year around this time. It’s just part of the fall season to me. This is my very favorite zucchini bread recipe and if you don’t have hazelnut oil or hazelnuts you can substitute walnuts and any other oil. This recipe and blog post was originally posted in 2012. Love being reminded of a favorite recipe that has withstood the test of time. From 2012: This is my second year attempting an urban garden in our little backyard. I learned a lot after my first year, but I still have so much to learn. Last year I planted way too much and the garden ended up looking like tangled dreadlocks. Years later I still feel like a newbie to garnering and I learn more every year. This year I planted zucchini again, along with tomatoes, peppers, melon, honey-nut squash and lots of herbs. Since 2012, we’ve changed our entire backyard into 3 large above ground planters so we have much more room… no more tangled veggies! • Cilantro doesn’t survive well in Utah (or at least I have killed a few cilantro plants here)… killed another one this year! • Flat leaf parsley grows well in Utah….as does basil, rosemary, tarragon, and thyme! • Rhubarb takes a few seasons to grow enough to harvest, tomato plants grow huge so you must buy cages (and the smaller part of the cage goes in the ground … I learned this by doing it the wrong way)…you also need to prune the tomato plants so they harvest more. • Spicy peppers grow well here…ever since 2012 I’ve grown at least one jalepeno plant and this year I also grew serrano and sishitos. • Anyone can grow mint, it is like a weed and flourishes every year (although I have killed it before by paying too much attention to it)…basically ignore it and it will be okay. This year, my zucchini plant provided several loaves of zucchini bread and countless side dishes. Recently, I put zucchini in chicken tiki masala; I’ve also added it to spaghetti, sauteed it with marcona almonds and rosemary, and just sliced it up raw for a fresh salad. After trying several different zucchini bread recipes over the years, I’ve found one that I love! My recipe calls for hazelnuts and hazelnut oil but you can substitute walnuts and walnut oil or applesauce for part of the oil. I really think the nut oil was the deal breaker for this recipe. The hazelnut oil enhances the bread flavor and the hazelnuts and pumpkin seeds on top give it a nice crunchy texture. 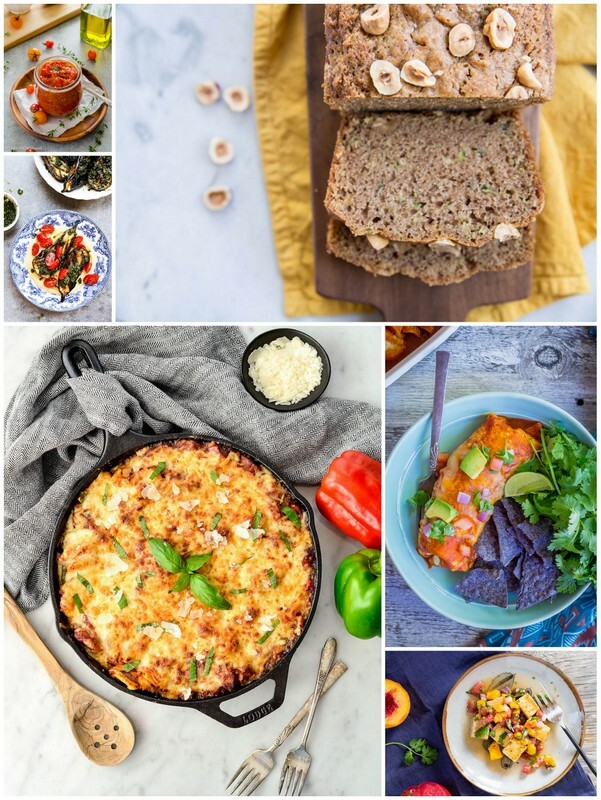 Here is a great group of more fresh and seasonal recipes to put on your must try list! 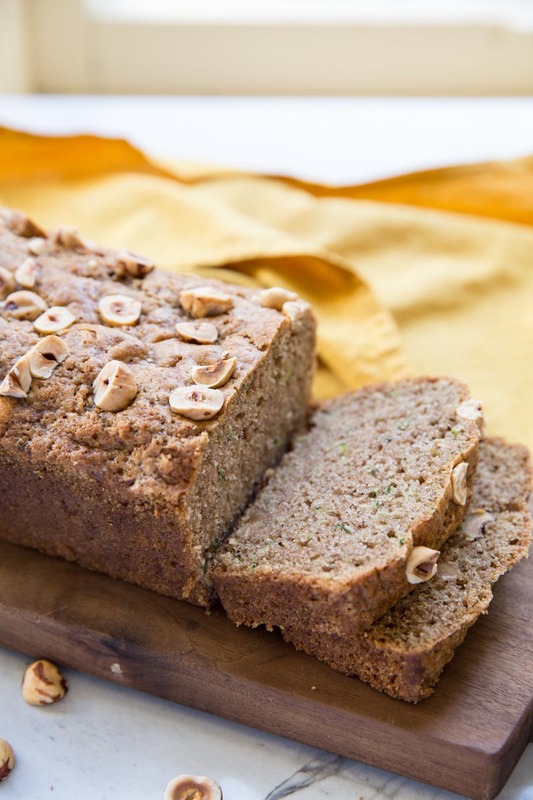 Use up garden fresh zucchini in this moist and flavorful hazelnut zucchini bread. Preheat oven to 350 degrees. Butter or spray loaf pans (2 large or 3 small). Beat eggs until light. Add the sugar, mixing well. Add the oil, zucchini, and vanilla, and mix thoroughly. Sift the dry ingredients. Add by the cupful to the egg mixture. Stir until well blended. Add the half of the hazelnuts. Spoon batter into the pans, sprinkling the rest of the nuts on top, and bake for approximately 40 minutes to 1 hour depending on size of pan used. Check with a toothpick to see doneness. Cool for 10 minutes in the pans then remove and let cool completely on wire racks. *If you don't have hazelnut oil on hand you can use walnut oil or canola oil. *For a healthier version, you can substitute some of the oil with applesauce..
*Zucchini bread freezes very well. I will have to make this recipe for myself. Too bad Josh can't have any..ha! This looks great! I'm only on my first Utah garden but can echo several of your thoughts – cilantro was a bust for me as well and mint is practically growing wild throughout my yard (including cracks in the driveway). My favorite use of zucchini is simply sliced like coins, brushed with just a touch of olive oil, sprinkled with kosher salt and roasted. So good! Your bread looks scumptious. Last year I swirled in Nutella to zucchini bread. I think this recipe would be a perfect fit for a swirl of Nutella. I was so happy to see you posted this, and i already made a two loaves; with a few necessary alterations. I'm so sad I forgot to add blueberries. it's delicious without them though, the perfect texture of a light crumb and crispy almost caramelized crust. bravo. I forgot to mention that I sprinkled Rum flavored sugar on top (you could also use natural sugar crystals). It added a sweet crunch to the top of the bread before baking, which my husband especially loved. I just now added this part into the recipe. I recently posted our favorite zucchini recipe on my blog. It's a simple bread, and we always leave out the nuts because we don't like them. i had the pleasure of sampling this delicious bread and can assure… it is wonderful. i love the new use for hazelnut oil! 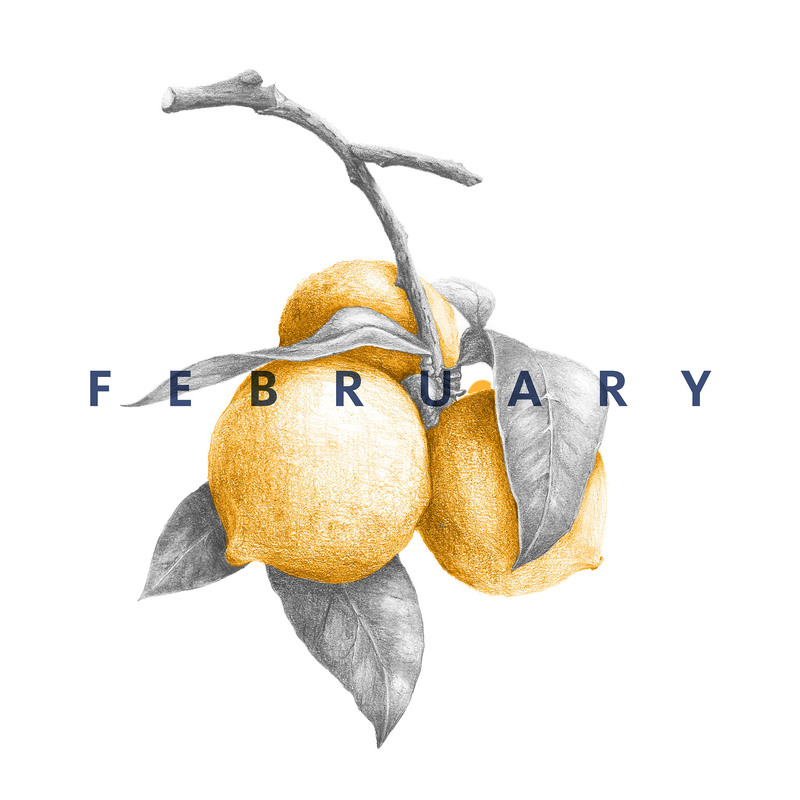 I recently launched my own blog, I'd love for you to check it out and let me know what you think! 🙂 Thanks! Your Zuchini Bread Recipie looks scrumptuous. I hope it is not necessary to ‘home grow’ your zuchini in your own garden, as I am not a gardener. Perhaps the next time M’lu and I are in SLC, we can sample your Hazelnut Zuchini Bread. We can’t remember ever having any. It does look absolutely delicious. Gorgeous, Becky! The hazelnuts look beautiful on top of the bread. 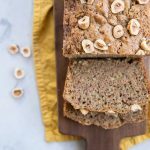 I love all kinds of quick bread- definitely bookmarking this to try! Your blog is really great! Thanks for sharing this recipe. My wife and I had fun baking this bread and it tasted wonderful. She was happy that the recipe didn’t call for butter. 🙂 The idea of substituting apple sauce for oil is a great tip! It would be helpful if you can also mention the serving size in your recipes. Thanks for the tip. I will try to do that in the future! I’m so glad you enjoyed the bread! 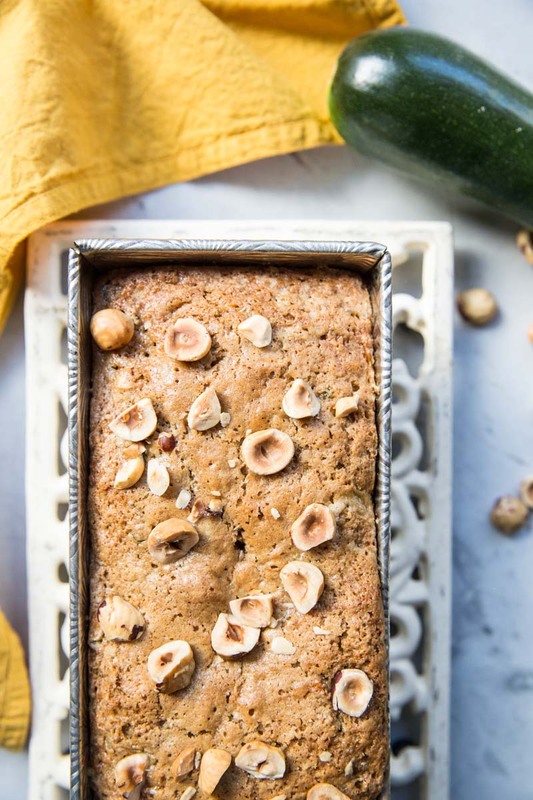 I love hazelnuts and I bet they are awesome in this zucchini bread. And love that you’re giving an older post some attention and bringing it back to the front. I love doing that, too. I have so many gems that I’ve forgotten about over the years! 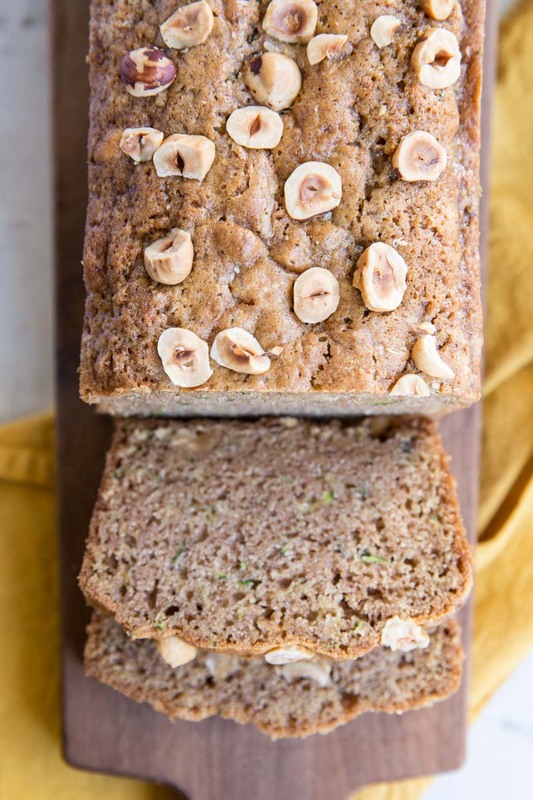 I don’t bake with hazelnuts enough and I love the idea of adding them to zucchini bread! This definitely looks like a keeper. Its so funny what we learn each year from gardening. Tomato plants have been mostly a headache for me so this year I only planted two san marzanos in hopes of making big batches of tomato sauce. Everett grew zucchini from a seed so I had no choice but to plant that.. ha! It’s always an adventure! I never had much luck with a garden in Utah and I really don’t have any luck with one here in Arizona haha! Someday! 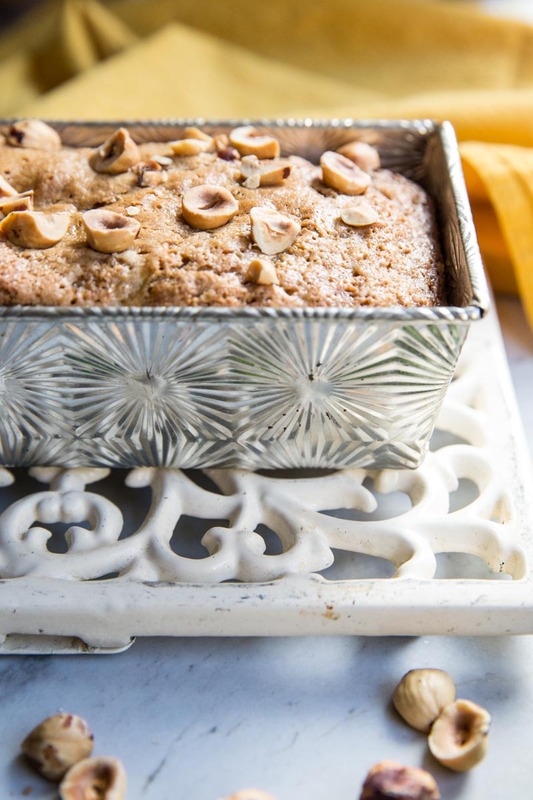 I love that you added hazelnuts to this zucchini bread, such a nice touch! I imagine that you’d have to water a ton in Arizona. We have full sun in our backyard so I water once a day and can’t skip very often or things start dying. I have slowly learned over the years but I definitely don’t have a green thumb either Izzy! I can just about taste the flavor depth hazelnut oil gives this bread! Mouth watering here–just thinking about it! 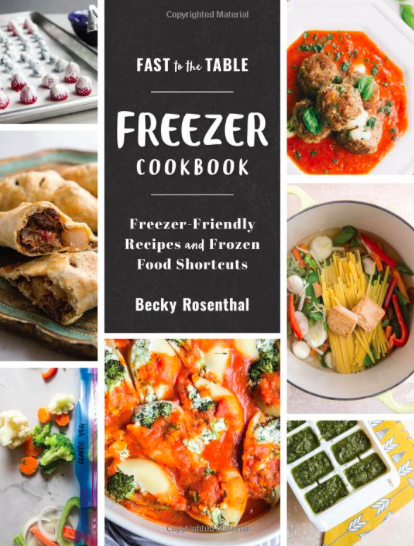 Hi Becky, your post really very well and i will try to make this recipe of myself.